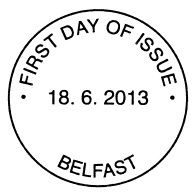 Are you sure the details for 1st Class – Ulster Transport Authority W Class No. 103 are correct? Very unlikely to be County Donegal, which isn't in Northern Ireland. Actually rather disappointed by this issue. The information is provided by Royal Mail. The locomotive stock of the Northern Counties Committee of the LMSR was combined into the UTA in 1949, not being part of the 1948 nationalisation. There was more cross-border traffic at this time than after 1958 when the GNR line was the only one remaining. The train is emerging from one of the tunnels between Downhill and Castlerock, County Londonderry. The land rising in the distance, across the sea, is part of Inishowen, County Donegal. Thomas Somerset was the Chairman of the NCC Board of Directors. Thank you. So the description is wrong, but the trains did run cross-border? Well, it depends which trains you're asking about. Certainly there were (and are) cross-border train routes to/from NI. 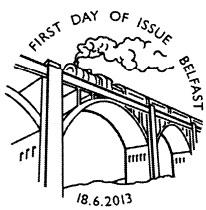 The 1st class stamp shows a Londonderry (Waterside) to Belfast (York Road) service. This travelled via Coleraine, not crossing the border at any point. 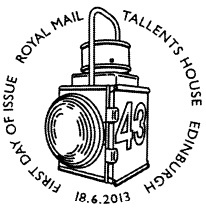 Cross-border services would be more strongly represented by the £1.28 stamp, depicting a loco. of the County Donegal Railways Joint Committee. The County Donegal narrow-gauge system was largely in the county of that name, crossing the border at Lifford/Strabane, its line between Strabane and Derry traversing stretches of Counties Tyrone and Londonderry. Perhaps we shouldn't say that the railway crossed the border but rather the border crossed the railway (it was there first). John, I like your final comment! Perhaps, as in other matters, we should just regard the railways as Irish, despite the issue title. 1. The train was not an express. 2. The phrase "up-express" is wrong - it should be "up express" or, more informatively, "a Belfast-bound express"
3. The location is the tunnels at Castlerock in county Londonderry. It is not in County Donegal which is not in Northern Ireland - though that Inisihowen in that county appears in the right background across Lough Foyle. Seems like RM have made the classic geographical error and confused N.I. (6 counties) with the Province of Ulster (9 counties - Donegal being one of the extra 3). Sloppy research. Tut, tut.